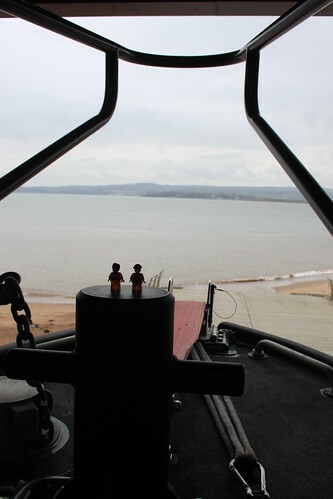 In our last post, we talked about the Crew’s visit to Exmouth lifeboat station. We took a tour around the building and met some of the station’s crew and volunteers, but didn’t talk much about the station’s two lifeboats. 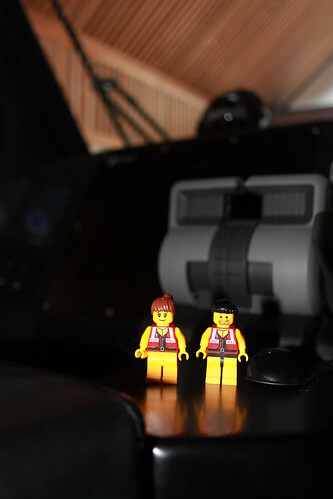 So in this week’s post, we’re going to look in more detail at the station’s brand new Shannon class all-weather lifeboat. As we mentioned last week, the 13.6 metre Shannon class all-weather lifeboat is the newest class of lifeboat in the RNLI fleet and Exmouth was only the second station to have one on service. With twin waterjets powered by two 13 litre, 650 horsepower Scania engines, it has a top speed of around 25 knots and a range of 250 nautical miles. 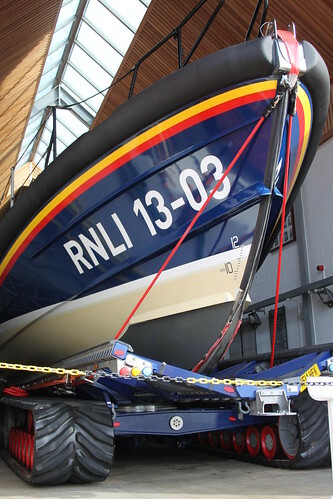 The Shannon can lie afloat, but is designed specifically to be launched and recovered from a slipway or beach using a new faster and safer launch and recovery system. But more about that next week, as it’s so cool as to merit a post of its own. 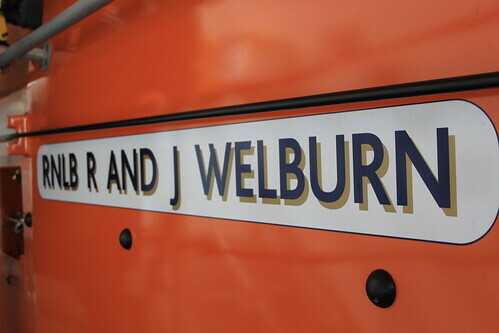 Exmouth’s Shannon is named ‘R and J Welburn’ and was funded by a generous bequest from Mrs Joan Welburn in honour of her husband, whose family had a tradition of service with the RNLI. 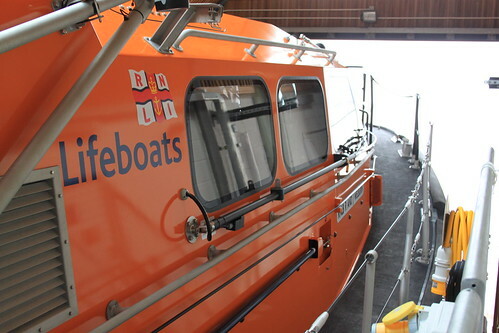 The lifeboat is housed in the boathouse and is launched down the slipway in front of the building and, if the tide is out, across the beach. 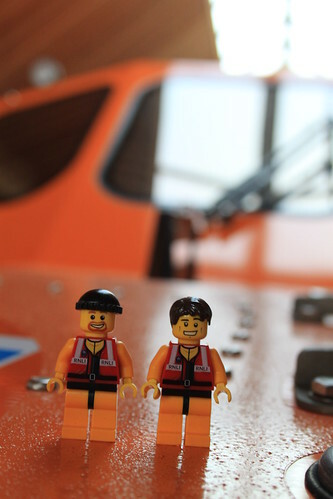 The Crew were keen to get their tiny mitts on the nice, shiny, new lifeboat, so our guide Emma, the station’s voluntary press officer, kindly agreed to give us a tour. 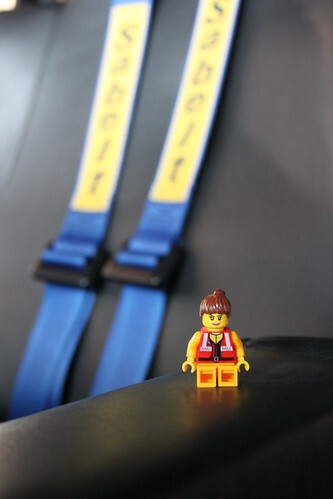 The boat is accessed from the first floor level of the boathouse, directly from the all-weather crew changing room, and is launched with the crew in their seats and ready to go. The Shannon demonstrates a clear step change in the design of RNLI lifeboats, with its speed, range and manoeuvrability outpacing significantly that of its predecessor, the Mersey class. And having had the chance to look around this £1.5 million example of state-of-the-art marine technology, I can see why the Exmouth crew were so keen to have one of the first of the class on service at their station. The Shannon has two steering positions, but only one steering wheel. 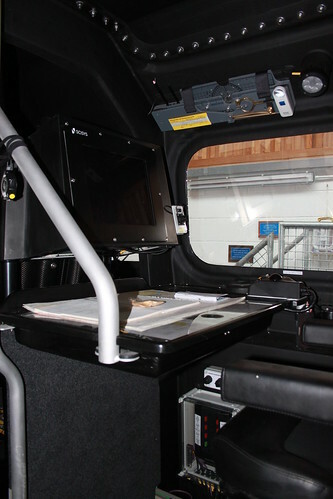 The wheel is on the upper steering position, which offers excellent visibility for close quarters manoeuvres. The main steering position in the cabin, though, has a joystick rather than a wheel. 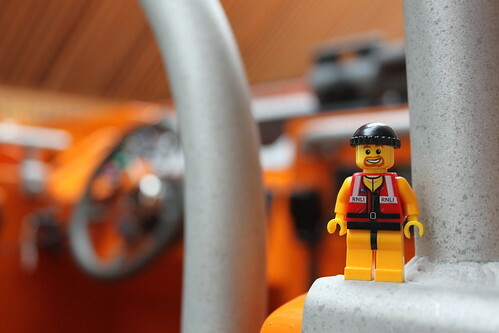 The thought of 15 tonnes of lifeboat being controlled by this teeny-weeny little stick was quite overwhelming. Emma explained that once the Shannon had arrived on station, the Exmouth crew spent several days getting used to the boat and to the equipment that she carries on board. This meant that when the final handover took place, they were as familiar with her as they had been with their old boat. Given that the lifeboat will have to operate in the most challenging conditions, the ability of the crew to function effectively – and safely – whatever the weather, is of the utmost importance. 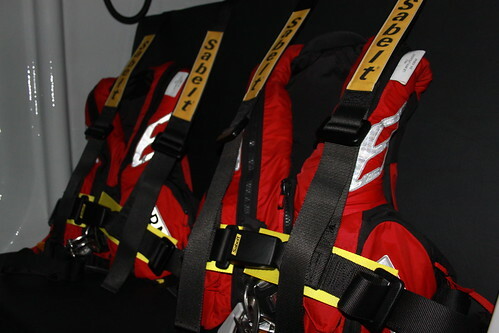 So in the main cabin, each member of the crew has his or her own seat, from which they are able to access all of the systems that they need to do their job whilst remaining strapped in securely. In addition to the main crew cabin, the Shannon has a survivors cabin at the forward end, which can take six people. The boat can also hold another 17 survivors in the two cabins if they’re happy to stand, or a mind-blowing 79 people if we’re not worried about the boat retaining her self-righting properties. It’s clear that the Shannon is a fantastic lifeboat and that she packs a lot of punch into her 13 metre length. And she will no doubt serve the Exmouth crew – and the crews of the other stations where Shannons are arriving on service – extremely well. And, as I mentioned early, the launch and recovery system is equally impressive. But for that, and the station’s zippy little D class, I’m afraid you’ll have to wait until next week. This entry was posted in Out and about and tagged Exmouth, Lifeboats, RNLI, The Lifeboat Crew by Simon Perks. Bookmark the permalink.